An exhibition of works by 25 emergent artists. 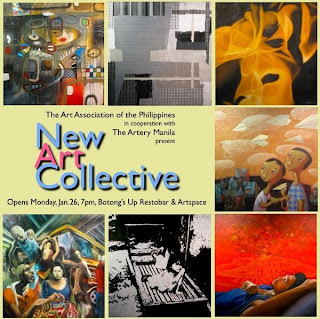 Exhibit opens on Monday, January 26 at 7pm. Venue: Botong's Up Restobar and Artspace, Ground Floor of A. Venue Mall (across Great Eastern Hotel formerly Aberdeen Court), Makati Avenue, Makati City.